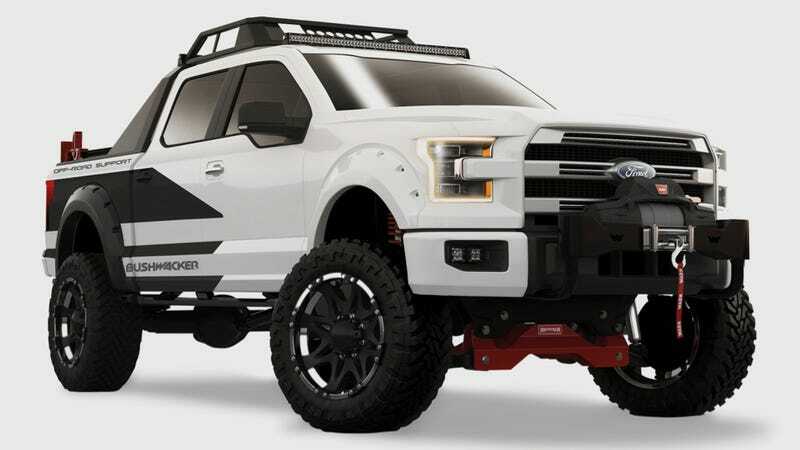 We've already seen a few desert racing variants of the 2015 Ford F-150 from this year's SEMA show, but Bushwacker's "Off-Road Support" rig looks like more of a mud crawler. And the look is pretty mean. The chunky front bumper fits the look of the face pretty well, and I have to say I'm liking these angular bed-roll bars we're seeing on the new F-150 off-road kits. This truck is showcasing Bushwacker's "Pocket Style" Fender Flares and a few other upgrades from ARB, Bestop, CargoGlide, Hi-Lift, Mac's, Mickey Thompson, Skyjacker, Stampede, Vision X, and Warn Industries.